KABUL - President Hamid Karzai said Saturday that the United States must reduce the visibility and intensity of its military operations in Afghanistan and end the increased U.S. Special Operations forces night raids that aggravate Afghans and could exacerbate the Taliban insurgency. In an interview with The Washington Post, Karzai said that he wanted American troops off the roads and out of Afghan homes and that the long-term presence of so many foreign soldiers would only worsen the war. His comments placed him at odds with U.S. commander Gen. David H. Petraeus, who has made capture-and-kill missions a central component of his counterinsurgency strategy, and who claims the 30,000 new troops have made substantial progress in beating back the insurgency. "The time has come to reduce military operations," Karzai said. "The time has come to reduce the presence of, you know, boots in Afghanistan . . . to reduce the intrusiveness into the daily Afghan life." Karzai's comments come as American officials are playing down the importance of July 2011 - the date President Obama set to begin withdrawing U.S. troops from Afghanistan - in favor of a combat mission ending in 2014. The Afghan president has placed himself squarely in favor of a lighter military footprint as the administration reviews the progress of the Afghan war and debate intensifies about the pace of the withdrawal. Karzai says his troops are ready to take more responsibility for their own security. In an hour-long interview with Post reporters and editors in his office in Kabul, Karzai said he was speaking out not to criticize the United States but in the belief that candor could improve what he called a "grudging" relationship between the countries. He described his own deep skepticism with American policy in Afghanistan - from last year's presidential election, which he said was manipulated by U.S. officials, to his conviction that government corruption has been caused by billions of American dollars funneled to unaccountable contractors. And he said Afghans have lost patience with the presence of American soldiers in their homes and armored vehicles on their roads. Karzai has long been publicly critical of civilian casualties at the hands of U.S. and NATO troops and has repeatedly called for curtailing night raids into Afghan homes. Under Petraeus and his predecessor, such raids by U.S. Special Operations troops have increased sharply, to about 200 a month, or six times the number being carried out 18 months ago, said a senior NATO military official, who requested anonymity so that he could speak candidly about the situation. These operations capture or kill their target 50 to 60 percent of the time, the official said. To American commanders, the nighttime strike missions are a crucial weapon to capture Taliban commanders, disrupt bomb-making networks and weaken the 30,000-man insurgency in Afghanistan. In the past three months, U.S. Special Operations troops have killed or captured 368 insurgent leaders. On each mission, Afghan commandos accompany U.S. troops and Afghan officers work with the Special Operations command at Bagram Airfield to choose targets, military officials said. "We understand President Karzai's concerns, but we would not be as far along as we are pressuring the network had it not been for these very precision operations we do at night," the NATO military official said. "I don't see any near-term alternative to this kind of operation." But Karzai was emphatic that U.S. troops must cease such operations, which he said violate the sanctity of Afghan homes and incite more people to join the insurgency. A senior Afghan official said that Karzai has repeatedly criticized the raids in meetings with Petraeus and that he is seeking veto power over the operations. The Afghan government does not have the type of legal arrangement that the Iraqi government has with U.S. forces to approve particular military operations. "The raids are a problem always. They were a problem then, they are a problem now. They have to go away," Karzai said. "The Afghan people don't like these raids, if there is any raid it has to be done by the Afghan government within the Afghan laws. This is a continuing disagreement between us." Karzai, who said during his inaugural speech last year that he would like to have full Afghan security control by 2014, said that the U.S. military "should and could" draw down its forces next year. He acknowledged that an abrupt withdrawal would be dangerous but said that American soldiers should confine themselves more to their bases and limit themselves to necessary operations along the Pakistani border. He said he wanted the U.S. government to apply more pressure on Taliban sanctuaries in Pakistan while focusing on development projects and civilian assistance in Afghanistan. Although he did not say how many U.S. troops he would prefer in Afghanistan, Karzai said that at current levels "you cannot sustain that." There are about 100,000 U.S. troops in Afghanistan. "We'd like to have a long-term relationship with America, a substantial relationship with America, that's what the Afghan people want. But we'd like the Afghan countryside - villages, homes, towns - not to be so overwhelmed with the military presence. Life has to be seen [as] more normal," he added. Insurgents have stepped up their attacks this year to record levels. In the past two days, a car bomb exploded in Kabul and fighters attacked a NATO observation post at the Jalalabad airport in eastern Afghanistan. Saturday's early morning airport assault sparked a lengthy gun battle that left six insurgents dead, including two wearing explosive vests. As the American military campaign has moved into high gear, U.S. officials have grown increasingly concerned with the failure of the Afghan government to root out corruption and provide services to the people. Karzai deflected this criticism by arguing that much of his government's corruption problem comes from the American money that is pumped into the country outside the control of Afghan ministries and frittered away on private security firms that undermine the authority of Afghan security forces. During the Soviet occupation, he said, ministers lived in modest housing blocks and the foreign money flowed through the Afghan government. "How come we are now so luxury-oriented today?" he asked. " The transparency of contracts is not there. Why is the U.S. government giving contracts to the sons and relatives of officials of the Afghan government? We don't do those contracts. I don't have an authority over a penny of those contracts. . . . and we've been protesting against this for years." On the issue of negotiations with the Taliban, Karzai said that he met with Taliban leaders in "one or two" meetings about three months ago, but that the talks were in a nascent stage and amounted to little more than "the exchange of desires for peace." He would not name the insurgents he has met but described them as "very high" level and said that he believed that Taliban leader Mohammad Omar has been informed of the discussions. Karzai said he was grateful to the American people for their support, particularly the flood of taxpayer money for new schools, roads, clinics and other development projects. But he questioned the Obama administration's motives. Karzai said he has become accustomed to the barrage of criticism against him and his family - allegations including graft and drug trafficking. The U.S. ambassador to Afghanistan, Karl Eikenberry, wrote in a cable last year that Karzai was not an adequate strategic partner and warned against sending troops to bolster such a troubled government. "If a partner means a silent spectator of events conducted by Washington, if that kind of partner you seek, well, I'm not that partner," Karzai said. "Nor will be the Afghan people." You are really speaking to a skeptic mind-set here in Afghanistan, that doesn't know whether the international community is here to fight terrorism. And if it is fighting terrorism, do they know that they're making mistakes? Whether the international community is here to free Afghanistan from the troubles that it had and strengthen it, or if it's added to those problems? The message that I have for the American people is, [first], that we know in Afghanistan that America earns money the hard way. That you work hard. I've seen people working in America, that all that you spend there are hard earned, from your younger people to the older people. They wake up early in the morning, they wake up much earlier than us, and go to work, and toil the whole day, shed a lot of sweat before they can earn a dollar. But that dollar spent in Afghanistan doesn't reach the Afghan people the way it should. Second, the intentions that you have in America towards Afghanistan as a people, as a country, is not reflected here in Afghanistan the way it should. It sometimes is reflected in contradiction to what you are thinking as an American people. The security firms, for example, how can you have a country grow a police force if you have created a parallel structure of at least 40,000 men with more money, with more salaries, with less accountability to them, and yet expect us to have a strong and effective police force and one that can provide you and the Afghan people with security. Then our elections last year were rigged. An effort was made by our allies, by people in the United States of America, by people in your government, to rig our elections. How can you rig a country's election and yet claim to be supporting democracy, and yet claim to be supporting that country, and yet claim to be building that state? It isn't all as it is reflected in your media in America, or propagated by government circles. Our faults, we have our faults, we have too many faults, we are a poor country, we are a highly under-educated country, we have centuries of backwardness to cope with, we have lots of other difficulties of our own, but we are genuinely trying to emerge out of that misery, we are genuinely trying to fight terrorism, we are genuinely trying to be a country that likes to live well with its neighbors and with the rest of the world. We genuinely want to be partners with America for good and for good causes. The way things are moving, we don't seek clarity on these accounts, whether we are treated as equal, let's not talk of equal, whether we're treated respectfully or whether we're seen as 'hell, these third world guys, lets use them and abuse them and confuse them.' That attitude I'd like to end in America, whether it's in the government or whether it's in the media or wherever. On top of that, I must also express gratitude on behalf of the Afghan people for the taxpayers' money that has come to Afghanistan, for the schools that you have built for us, for the health clinics you have built for us, for the education that you have given to us, for the advancement that we have today, for the roads that you have built for us, we are extremely and highly and permanently grateful and indebted to you for that. And we'd like that to expand, that side of America we'd like to see more. The American people are well intentioned. I think 10 years is a long time to continue to have military operations. The time has come to reduce military operations. The time has come to reduce the presence of, you know, boots in Afghanistan . . . to reduce the intrusiveness into the daily Afghan life. . . . Make it more civilian. The Afghans remember with very fond memories, with a lot of love and affection, all the roads and dams that you built in 1950s and '60s. That can be replicated, that can be repeated. You cannot sustain that, first of all, on your own for long. Second, it's not desirable for the Afghan people either to have 100,000 or more foreign troops going around the country endlessly, there has to be a plan inside whereby the Afghan capacity increases, whereby the NATO presence decreases to the extent that we can provide our own security, that we can also contribute to the security of the world, and where you can also have the unnecessary burden on your taxpayer removed for paying for such an extensive presence in Afghanistan. We'd like to have a long-term relationship with America, a substantial relationship with America, that's what the Afghan people want. But we'd like the Afghan countryside, villages, homes, towns, not to be so overwhelmed with the military presence. Life has to be seen [as] more normal. More in terms of peace and civilian activity in Afghanistan, you can have the U.S. presence in the bases where they are, you can have necessary activities along the border conducted, but the majority of security operations, the majority of day-to-day activities where security is concerned . . . is the job of the Afghan people, the Afghan government. If we cannot provide that, we must be in serious trouble. We have to begin to do that ourselves. The raiding homes at night. Terrible. Terrible. 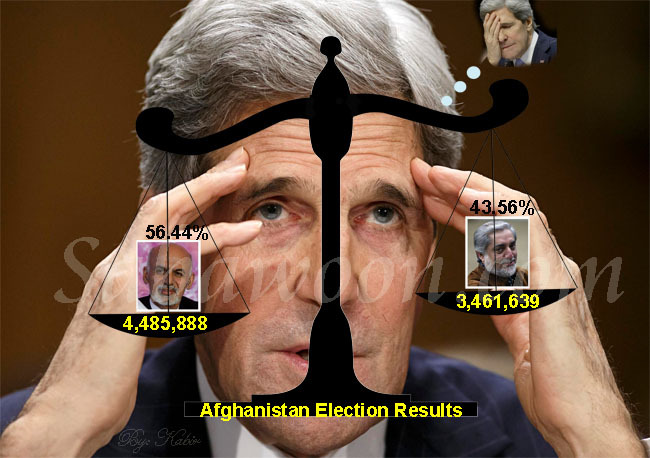 A serious cause of the Afghan people's disenchantment with NATO and with the Afghan government. Bursting into homes at night, arresting Afghans, this isn't the business of any foreign troops. Afghans have to do that, and one of the important elements of transition that we're working on is to end [these] raids of Afghan homes and arrest of Afghans by foreign forces in Afghanistan and civilian casualties. Plus so many other things, the violence and the violation of our laws that these private security firms cause, the parallel structures, the PRTs [Provincial Reconstruction Teams] running a parallel government to the Afghan government in provinces, the money that they spend without accountability and without us knowing, the corruption that that causes. The raids are a problem always. They were a problem then, they are a problem now. They have to go away. The Afghan people don't like these raids. If there is any raid, it has to be done by the Afghan government within the Afghan laws. This is a continuing disagreement between us. They like to conduct this thing that they call the war on terror, which we don't call that anymore in Afghanistan. Because in my opinion and in the opinion of the absolute majority of the Afghan people, the war on terror cannot be conducted in Afghanistan because that isn't here. It is somewhere else. We are only reaping the consequences of it here, we are only facing the consequences of it here, so I would like to have an end sooner rather than later to these nighttime raids in Afghan homes, no matter how effective they are in the sense of the military in the United States or in NATO, no matter how happy they may be about it in America or in NATO, for capturing this or that Talib. How can you measure the consequences of it in terms of the loss of life of children and women because you have captured Talib A. And who is this Talib A? Is he so important to have 10 more people killed, civilians? Who determines that? I don't like it in any manner, and the Afghan people don't like these raids in any manner. We don't like raids on our homes. This is a problem between us, and I hope this ends as soon as possible. We like partnership with America. We like long-term strategic partnership with America. We'll accommodate your long-term interests in this region, and in Afghanistan. We will fight with you against terrorism. But terrorism is not invading Afghan homes, and fighting terrorism is not being intrusive in the daily Afghan life. There is so much talk in the West about corruption in the Afghan government. Look, we have not metamorphosed overnight into this corrupt state as we are today. We were a country before, too. How come we were not so corrupt then? How come we are suddenly corrupt and everybody's corrupt? There must be a reason. The Soviets were here, and they were spending all their money through the Afghan government. The Afghan government was not corrupt, our ministers were living in these housing blocks. How come we are now so luxury-oriented today? The transparency of contracts is not there. Why is the U.S. government giving contracts to the sons and relatives of officials of Afghan government? We don't do those contracts. I don't have an authority over a penny of those contracts. How come the political higher-ups and their relatives are getting those contracts from the U.S.? And we've been protesting against this for years. How come all the political higher-ups and the leaders of this country are encouraged to sign for private security firms? We have no control over that money, and I have resisted it with massive energy spent on the issue for the past two years, every person who has some influence over me has been encouraged to go and apply for a private security firm, so somebody must be doing this. We have problems of corruption in the Afghan government, definitely, the daily petty corruption affects our society very badly, the violation of Afghan laws. This is the main problem in the war on terror. There was a time early on that the United States could work effectively on the sanctuaries, where there was full backing by the Afghan people, in this regard. It didn't happen. And now they're addressing this problem by the drone attacks, and also by talking and continuing to engage with Pakistan. Sanctuaries [are] a problem. A serious problem. For Afghanistan, now also for Pakistan. I just hope that Afghanistan, the United States and Pakistan together will do all that we can together to address the problem. For the initial years, I was highly critical of Pakistan and their lack of action on the sanctuaries. Now . . . I see Pakistan suffering more than we are in lots of ways, especially in the consequences of the violence that these sanctuaries and the militancy there. On the one hand, I sympathize with them and want to be closer to them and work together to address it. On the other hand, I'd like to ask them to do more on the sanctuaries and for the United States to pay closer attention to this problem. Peace in Afghanistan will not come unless we address the question of sanctuaries and unless Afghanistan and Pakistan are on the best of terms as friends and neighbors and brothers, with America, present with us and among us. My nature is not one that appreciates military. I'm not a pro-gun person, I don't like guns or airplanes, so I can never talk in favorable terms about planes that are shooting people or bombing people, so you'll have to ask a more hard-core fellow, I'm a soft-core fellow. It's soothing. it's a lot better. Last year and the year before that, 2007 and 8 an 9, were the highest of tension times. It's a lot better today, with Gen. McChrystal it improved considerably, with Gen. Petraeus it improved considerably. There is a healthy debate between us at least. Now I can talk to you openly about my feelings, about my sensitivities, about the sensitivities of the Afghan people, and I do the same thing daily with Gen. Petraeus and with President Obama. So we are in a more mature relationship, sentimental, emotional elements have gone away, we don't shout at each other as often as we did before. We are quieter, we are substantive in our engagement, and the relationship is more real, more result-oriented. We discuss issues and we convince one another of the right thing as we perceive it. This is not criticism, this is working a difficult, extremely delicate relationship, on an extremely important issue, of the war on terror and the recent situation and the relationship between a superpower and a poor country. They should and could. Exactly. Decline. And the more they like to decline, the more they want to decline, the more they should help build our forces. That will be cheaper and more sustainable. That's not for me to judge, that's for the technical people to judge. As a political consideration, I'll put it in broad terms: 1) The Afghan people should be able to defend their country in all aspects of it as soon as possible; 2) While that is being done, the intrusiveness of the foreign forces in Afghanistan must be reduced so they're not present in the daily lives of the Afghan people the way they are today. At this point, it's the exchange of desires for peace on both sides. They feel the same way as we do here. That too many people are suffering for no reason. Their own families are suffering. They're also families. The Taliban is not a man manufactured in a factory and then brought to - the suicide bombers may be but not the Taliban - they are people, they have families, they have wives, they have children, they have mothers, they have fathers, they have cousins. And they suffer too. They suffer exactly from the hands of the same elements. When there is a bomb blown up by a suicide bomber, maybe a Taliban family member is standing by and gets hurt. So they do suffer as we do, and it's this suffering, a national suffering, they'd like to address with us. They're not that far yet. They have not formalized their ideas for peace concretely yet. It depends on how you define a partner in America. If a partner means a silent spectator of events conducted by Washington, if that kind of a partner you seek, well, I'm not that partner. Nor will be the Afghan people. If a partner means where we look after your interests, you look after our interests, where the Afghan people have safety and security and dignity, where the United States has safety and security and dignity, and much richer. Where Afghanistan is asked to fulfill that job for America, where your lives are safer, your lives are more secure, and your integrity and your well-being is ensured and your riches are added to, we will be that partner. But if you mean by a partner someone that will keep quiet when a village is bombed, then that's a good partner? No, I will not be that partner. I will speak for Afghanistan, and I will speak for the Afghan interest, but I will seek that Afghan interest in connection with and together with an American interest and in partnership with America. In other words, if you're looking for a stooge and calling a stooge a partner, no. If you're looking for a partner, yes.